Jane, a loving mother of two, has drowned her toddler son and is charged with his murder in this powerful examination of love, loss, and family legacy. When a prosecutor decides Jane’s husband Tom is partially to blame for the death and charges him with “failure to protect,” Tom’s attorney proposes a radical defense. He plans to create reasonable doubt about his client’s alleged guilt by showing that Jane’s genealogy is the cause of her violence, and that she inherited her latent violence in the same way she might inherit a talent for music or a predisposition to disease. He argues that no one could predict or prevent the tragedy, and that Tom cannot be held responsible. With the help of a woman gifted with the power of retrocognition—the ability to see past events through objects once owned by the deceased—the defense theory of dark biology takes form. An unforgettable journey through the troubled minds and souls of Jane’s ancestors, spanning decades and continents, this debut novel deftly illustrates the ways nature and nurture weave the fabric of one woman’s life, and renders a portrait of one man left in its tragic wake. I’ve been meaning to read Janeology for a LONG time now. Back when the book was first published, a bunch of book bloggers toured the book and I was very intrigued by the premise and interested to see how it actually played out in the book. I’m glad my local library finally had a copy so that I could finally see for myself what all the fuss was about. I liked Janeology, I did not love it. The premise itself is the most interesting thing about this book, but unfortunately I didn’t feel what I was expecting to feel while reading the book. I really thought that I’d feel intense compassion, sympathy, and other emotions for Tom and even Jane herself but I didn’t feel very connected to these characters at all. In a book dealing with such a sensitive topic as the murdering of ones’ own children, I assumed there would be a lot of emotions in the mix – which there were, from the characters themselves, but for some reason those emotions did not transfer appropriately to me while I was reading the novel. What I did like about the book was how thought-provoking it was. I always take such interest in these types of stories when they are in the headlines, and it is always my natural assumption to think that there has to be some reason why somebody would do something SO awful as kill somebody that they love (whether it be children, parents, siblings, etc.). A mother killing her own children is so above and beyond anything a “normal” person could imagine doing that it makes us think, as a society, even harder about how such a thing could happen. My natural inclination is to believe that no sane person would do something like that – there has to be something in that woman’s background that would make her so abnormal, so messed up to have such a huge break from reality and do something so awful to her own flesh and blood. So Janeology was very interesting to me as Harrington really explored this concept in detail. Much of the book focused on Jane’s experiences growing up, on the factors throughout her life that could have possibly been the build-up for her committing such an atrocious crime. What is fascinating to me is that the types of experiences Jane had were terrible, of course, yet I know thousands of people suffered the same kinds of things as children – yet they did not kill their own kids and Jane did. Keep in mind this is a work of fiction, but I think it draws stunning parallels to real life. Women DO kill their own children, and as a society we desperately try to figure out why. This book gives some ideas but by no means does Harrington try to explain this horrific thing that some women have done. Overall, Janeology is an incredibly interesting and thought-provoking read that I think many fiction readers will really enjoy. Although I did have a few minor issues with the book, I did like it and would recommend the novel. I won a copy of this and am really looking forward to reading it! This is on my TBR list already. Kind of sounds like something Jodi Picoult would write. I truly enjoyed your review and it’s pushed me to pick this one up!! I’ve had this one on my TBR list for awhile but just haven’t found the time to read it yet. It does sound interesting though! Thanks for a very insightful review of my book! You’ve got a cool blog here, too. Thank you for this review! I’d heard all the hype and it is nice to be tempered with a thoughtful review. sounds like i’d have to employ my suspension of disbelief to get through this one–a woman with supernatural powers? the premise is so promising…an age old question…i actually might give it a try, just to see how it plays out! thanks for the tip. I’ve been wanting to read this one for a while. Thanks for the honest review. I’ve tried to win this book a number of times and as one author said to me, I am very persistent. I would love to read this book and find out how it all plays out in this novel….thanks to you and Karen for another chance to win. 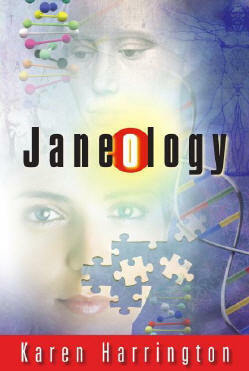 I’m entering to win a copy of Janeology as it sounds very intriguing. I like the premise that genealogy is used as a defense. I also like the challenge of reading a book that makes you think and this one sounds like it does that. To me, that is a sign of a good book!! I’ve been reading reviews of this all year and I remain on the fence as to whether I want to read it or not. There’s something about topics like this that make me feel like the rubber-necker slowing down for a better look at the accident on the highway. Ok, well ~~ first line almost scared me away. I really don’t like to think about a toddler drowning…. and by his mother. UG… But I am entering anyway. First review I’ve read of this book and it is thoughtprovoking. I’d love to read how the book leads into this novel defense. What a plot for a book. I am kind of stunned as at first I thought of in-the-news actual cases of mother’s who have drown their kids in bathtubs and smashed them with huge rocks (enough said) but then with the geneology aspect–well, what a novel twist. I don’t have problems reading sad books. I think The Lovely Bones was so sad but keep me reading. I am putting this on on my TBR list if for no other reason than it seems to be incredibly different. We always look for reasons behind events that are unfathomable. I think of the local case, of the father who threw his five children off a bridge to their deaths. A rational person cannot conceive how or why someone would do something so cruel. I’d like to read the novel to see how the theory of geneology-murder plays out. This really sounds like it would make you think!! I can’t understand what would make someone want to hurt their children, its unthinkable to me. Well, I don’t know if I should try for this, since you were kind of “meh” about it. Oh well, enter me anyway. Maybe I’ll like it. would love to read this..the subject matter is haunting yet intriguing. You know, I was about to pass this off as just another legal fiction book, then you tossed in that weird mystical stuff and I was like “Oh, well that is interesting.” Seriously. Law stuff usually bores the heck out of me (except Law and Order: SVU), but toss in some slightly magical strangeness and I’m intrigued. This book shouts to me on so many levels. As a sufferer of a genetically linked mental illness…depression…the premise of the defense sounds fascinating. Plus…Tuesday is my birthday…so having a new, good book to look forward to would be a wonderful birthday present!!!! Sounds like a sad book, but a good read. Thanks! This sounds like a very good & interesting book. I would appreciate being entered in the giveaway. Great review. I have read some mixed reviews on this book, but it is on my wishlist. Thanks for you great review. Please include me in your giveaway.